Although the field of trading psychology looks oversaturated at this stage, considering that we have such a jewel of the genre as Trading in the Zone by Mark Douglas, I would still like to share an e-book that offers an interesting approach to dealing with the psychological problems in trading. Enough to Be Dangerous is a very short e-book written by Brian McAboy, a trading psychology coach and business consultant. Brian is also a founder of www.InsideOutTrading.com (warning: auto-playing video inside!) — a training website for traders. You cannot approach something as difficult as Forex trading (or any other market) without a complete understanding of how things work there. When you are not ready to be an active trader, your mind will subconsciously disrupt your already low capabilities, resulting in a vicious circle and ending in a blown account. On the other hand, if you prepare yourself with a sufficient set of skills and knowledge, you subconsciousness will be helping you to succeed and reach your goal. The e-book is actually just an introduction that solicits the reader to take part in the author’s free webinar dedicated to trading. 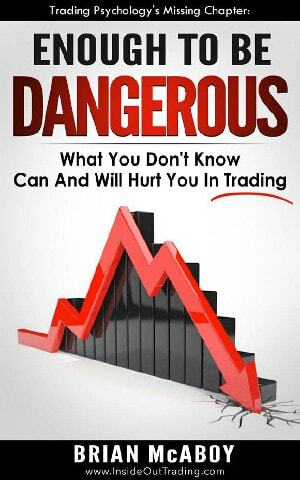 Still, new traders that do not want to spend money on expensive trading books may find this book, which is available as a free download, a nice step towards success. If you have any questions, comments, or opinions regarding Enough to Be Dangerous by Brian McAboy, please feel free to post them using the commentary form below.